You’ve found your perfect man and you have booked your special day, but what do you wear? Right now you will be thinking about your perfect dress for the day. You will come across various shapes and styles during your search for the perfect dress. By choosing the perfect shape of dress to suit your body shape you can ensure you will feel amazing on your day. That’s why we are so excited that Sassi Holford will be with us for a designer day on the 17th March. Sassi is so well known for her glamorous style of dresses. It isn’t often you get the opportunity of wearing such a fabulous gown with its fantastic corsetry and soft floaty skirts. 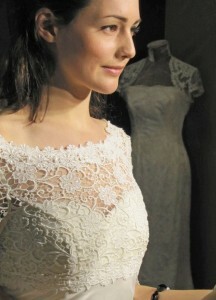 This year has seen her choose some of the most beautiful lace I have ever seen for her dresses. So we are offering you the opportunity of spending your appointment with Sassi herself. She will guide you through her amazing collection of beautiful wedding dresses and offer advice on style. Limited appointments available so book your personal appointment today so you don’t miss out! We are easily commutable from Berkshire, Surrey, Wiltshire and East Sussex. Why not enjoy a days shopping in Winchester following a wonderful appointment at Brides of Winchester.